A declining trend in long-term interest rates is a phenomenon that has been observed in many advanced economies since the 1990s, including in Japan, the US, and Europe. Especially after the Global Crisis, major central banks increasingly pay attention to these movements. This reflects their concern about declining potential economic growth (and the natural rate of interest) as well as weaker-than-expected inflation performance. Currently, economic growth is picking up in these economies. On a quarter-to-quarter basis, economic growth in Japan was 0.6% in the second quarter of 2017, compared with 0.3% in the first quarter; in the US the equivalent figures were 0.75% compared with 0.3%; and in the Eurozone, 0.6% compared with 0.5%. These economic growth rates have been well above their respective potential economic growth rates. Many market participants, therefore, take a positive view of the current stronger growth momentum and optimistically call it ‘synchronised global growth’ that helps to maintain relatively high stock prices. By contrast, these central banks and academics are not necessarily enthusiastic about the current economic performance. For example, Mario Draghi, president of the ECB, emphasised in his Jackson Hall speech on 25 August that the recent global growth recovery has been cyclical and would eventually converge to lower (potential) economic growth. He stressed the need to adopt domestic policies to raise productivity growth as well as promote global openness in trade, investment, and finance flows. the prospects of such declining trends reversing and beginning to rise in the foreseeable future. These issues are all essentially related to movements in the natural rate of interest. The natural rate of interest refers to the real interest rate that equalises savings and investment in the steady state, or the equilibrium interest rate that neither accelerates nor decelerates economic activities and inflation. This column will focus on these three issues by shedding light on the case of Japan. On the first issue, long-term (i.e. 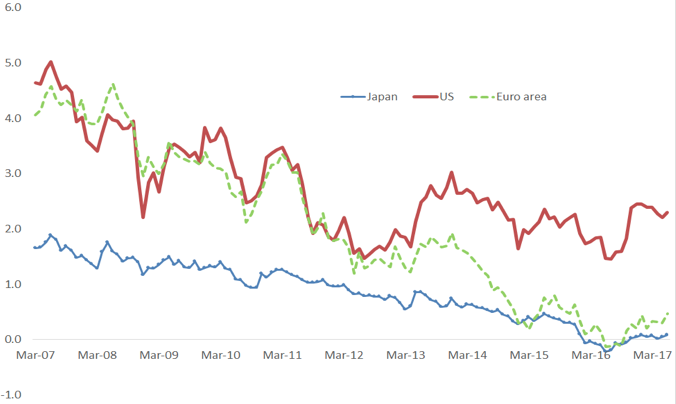 ten-year) interest rates fell both in nominal and real terms in Japan, the US, and the Eurozone from 2007–2017, as shown in Figures 1 and 2. These rates showed declining trends before and after the Global Crisis. It should be noted that these rates stopped declining and have become stable at low levels in recent years, for two possible reasons. One is that this may reflect that the effective lower bound exists not only on short-term nominal interest rates, but also on long-term nominal interest rates (or yields). The latter might prevail due to the adverse impact of banks, insurers, and pension funds – through shrinking interest margins, declining yields, rising liability caused by a lower discount rate, excessive risk-taking in search of yields, etc. The second reason is related to the movements of the natural rates of interest, which stopped falling, as mentioned below. Among these factors, major central banks focus on the natural rate of interest, partly because this concept is associated with the potential growth rate under certain conditions, and partly because this concept can be used to judge whether the monetary policy stance is expansionary or contractionary, as touched upon below. Several studies have estimated the natural rate of interest. They found that these rates had declining trends before the global financial crisis and have continued to decline after the crisis in advanced economies. For example, Laubach and Williams (2013, 2016) estimated that, in the US, the natural rate of interest dropped from around 3% in 2000 to around 0% in 2011–2017.1 Using the same approach, the Bank of Japan showed that, in Japan, the neutral rate fluctuated around 0% from 2000–2016 (Fujiwara et al. 2016). Holston et al. (2016) applied the same approach and estimated that, in the Eurozone, the natural rate of interest dropped from around 2.5% in 2000 to -0.5 in 2012–2016. Compared with the Federal Reserve and ECB, the Bank of Japan put more emphasis on the ‘natural yield curve’ as an extension of the conventional natural rate of interest at various maturities – rather than the natural rate of interest (which refers to short maturity). This is because Japan hit the zero lower bound and there has been no room left for a further decline since the 2000s, so that the corresponding natural rate of interest cannot be used to consistently evaluate the monetary policy stance. Based on the natural yield curve approach, the Bank of Japan announced that the 10-year yields on the natural yield curve dropped from a little over 1% in 2000 to around 0% in 2013–2016. What determines the natural rate of interest in Japan? The determinants of the natural rate of interest can be divided into structural factors and cyclical factors (Figure 3). Structural factors tend to be persistent, while cyclical factors – often called ‘headwinds' by the Federal Reserve – eventually dissipate. Thus, structural factors are more important. The structural factors contributing to the declining natural rate of interest in Japan reflect mainly declining potential economic growth, global factors, and Japan-specific factors leading to an increase in domestic saving over investment. Declining potential economic growth is a phenomenon seen in Japan from the 1990s, reflecting a decline in productivity growth and working-age population (and total population). According to the OECD (2017), potential economic growth in Japan dropped from 1% in 2000 to 0.7% in 2017. Thus, there appears to be a clear association between declining potential economic growth rates and declining natural yields. 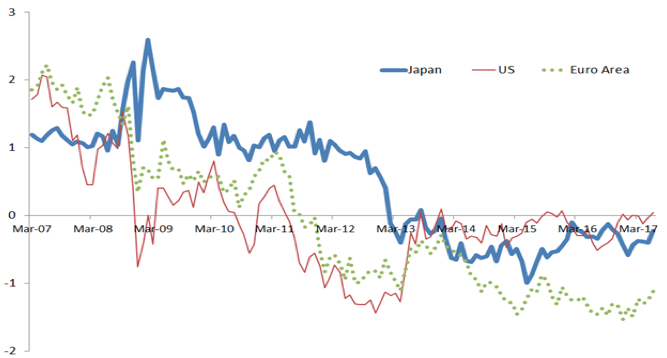 Global factors for Japan include global uncertainty (i.e. geopolitical risk, US economic policy and normalisation of monetary policy, Brexit, and China’s growing debt); declining potential economic growth in other advanced countries and China; declining prices of capital goods (thus less investment is needed); and, accumulated foreign reserves or current account surpluses in emerging economies. An additional factor is scarcity of safe assets or sovereign bonds with high credit ratings – due to a decline in supply and tighter financial regulations. Japan-specific factors that lead to an increase in domestic saving include increased corporate deposits due to high corporate profits from 2013 to 2017, as well as households’ savings caused by the growing number of women participating in the labour market, and rehired elderly persons (i.e., the baby-boomer generation, currently around 68-70 years old). The Bank of Japan’s study found that among double- or single-income households, double-income households tend to save more than single-income households, because the former’s disposable incomes tend to be more than 20% higher than the latter’s, while the former’s consumption tends to be 10% higher than the latter’s (Miura and Azuma 2017). The study also found that the saving rate for double-income households relative to single-income households was about 0.8 percentage points higher, even after controlling for income and financial assets. The study also showed that the propensity to consume declined in 2014–2016, mainly due to an increase in the relative number of double-income households. Going forward, the number of double-income households is expected to rise, possibly contributing to a higher saving rate. Meanwhile, factors affecting sluggish domestic investment include the outlook of a shrinking market for durable goods, a shift in production locations to overseas and growing offshoring, and a change in economic structure toward services. 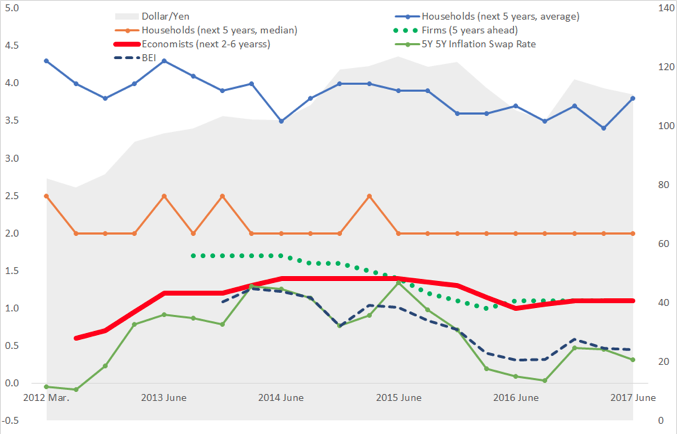 Is monetary policy sufficiently accommodative in Japan? The next issue is whether the Bank of Japan’s unconventional monetary policy has been sufficiently accommodative in an environment where the natural rate of interest and natural yields remain low. Central banks consider monetary policy to be accommodative if the real interest rate is substantially below the natural rate of interest. On this front, Haruhiko Kuroda, the Bank of Japan governor, stressed in 2017 that quantitative and qualitative monetary easing (QQE) adopted in April 2013 was aimed at lowering the real interest rate and yields substantially below their natural rates. Prior to QQE, he explained, the Bank of Japan could not have lowered real interest rates to such levels – in the face of a simultaneous decline in the natural rate of interest and inflation expectations since the mid-1990s, as well as the zero lower bound on short-term nominal interest rates since the late 1990s – and thus could not have generated sufficient monetary accommodation. The resultant downturn in economic growth rates had reduced prices; hence, weak economic growth and deflation had reinforced each other over a long period. Kuroda claimed that QQE produced its intended effects, as inflation expectations climbed notably and the output gap improved substantially after its introduction. The Bank of Japan’s report on the effectiveness of monetary easing also stressed that monetary accommodation was sufficient since the real interest rates and yields have been well below their natural rates. Despite the Bank of Japan’s claims, it is not clear whether real interest rates have been well below the natural rate of interest and natural yields because of the difficulty of measuring real interest rates precisely, and uncertainty surrounding the estimated natural interest rate and natural yields. For example, real short-term interest rates – taking the difference between overnight uncollateralised call rates and headline inflation – remain quite unstable and do not show clear declining trends, just like in the US and the Eurozone (Figure 4). This reflects the effective lower bound on short-term interest rates, sluggish core inflation (suggesting limited effectiveness of monetary easing), as well as volatile inflation due to fluctuating exchange rates and commodity prices. Meanwhile, the real interest rates appear to have become relatively stable at around 0% since 2015. Given that Japan’s estimated natural rate of interest has been around 0% in 2000–2016 as pointed out above, the monetary policy stance appears to have been neither accommodative nor contractionary in Japan. Note: Data refers to the difference between overnight money market rates (uncollateralised call rate in Japan, effective Federal Funds rate in the US, and EONIA in the Eurozone) and headline inflation (based on the CPI excluding the direct impact of the consumption tax hike in Japan, the PCE deflator in the US, and the HICP in the Eurozone). Source: Bloomberg, CEIC, Bank of Japan. More importantly, the long-term real interest rates vary substantially in Japan depending on the indicators of long-term inflation expectations used. In Japan, there is a wide divergence among various indicators of inflation expectations (Figure 5). In general, households’ inflation expectations tended to be very high and stable (both median and average) through 2012–2017; and, QQE and subsequent monetary policies have apparently generated no impact on their expectations. On the inflation expectations of economists, QQE had some positive impacts initially but since then has exerted little impact upon them. Firms’ inflation expectation indicators appear to have been affected moderately by a decline in commodity prices – rather than the monetary policy – since firms are very sensitive to import prices of materials and input. The 5-year 5-year inflation swap rate and the breakeven inflation rate are most volatile and appear to have been affected largely by the dollar–yen exchange rate, rather than by demand-driven inflation. If the inflation swap rate is used as a proxy for long-term inflation expectations, the long-term real interest rate has been declining since 2013 and entered negative territory in 2014, as shown in Figure 2. However, in mid-2015, the long-term real interest rate began to rise and currently remains at around 0%, mainly due to lower inflation expectations since mid-2015. If the 10-year natural yield remains at around 0% in 2013–2016 as mentioned above, this means that the monetary policy stance has been neither expansionary nor contractionary – contrary to the Bank of Japan’s claim. Source: Bloomberg, Bank of Japan, JCER. 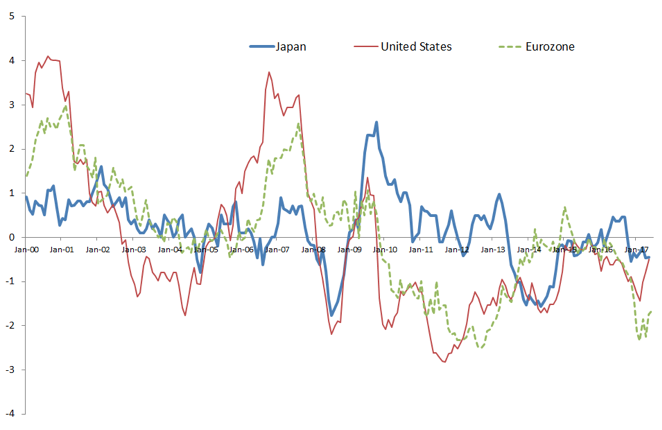 How about the impact on economic and price performance in Japan since adoption of QQE? The performance appears to have been better, though not as impressive as was expected by the BOJ. Figure 6 compares the average real GDP growth rate and the average rate of change in the CPI during fiscal year 2010–2012 (the period of ‘comprehensive monetary easing’ led by Kuniaki Shirakawa, Bank of Japan governor at the time) and fiscal year 2013–2016 (the period of QQE with a negative interest rate and yield curve control under Kuroda). While the average economic growth was higher during Kuroda’s term than during Shirakawa’s term, the average growth rates of real consumption, residential investment, and business investment during Kuroda’s term were lower than those during Shirakawa’s term. The rate of real export growth was impressively high under Kuroda’s period but export volume remained nearly flat, suggesting that higher real exports reflect an improvement in the quality of exports (this is a welcome result but it does not mean that the volume of higher-quality exports rose). The growth rate of public investment during Kuroda’s term exceeded that of Shirakawa’s term as the government increased public investment. Thus, the impacts of massive monetary easing since fiscal year 2013 have been mixed – not all the components of real GDP have risen since adopting QQE. Regarding inflation, QQE and subsequent policies contributed to higher inflation, but the durability of such trends remains uncertain since the major drivers of inflation have been the yen’s depreciation and commodity prices. Severe labour shortage has not generated higher nominal and real wages so far. Taking into account the large scale of monetary easing and greater fiscal stimulus provided under Kuroda’s period, the performance of economic activity and prices is unimpressive despite a sharp depreciation of the yen and higher stock prices. To summarise, on the surface it is not immediately clear whether monetary policy has been sufficiently accommodative in Japan. Ben Bernanke concluded that we must wait and see whether the Bank of Japan’s current policy framework is sufficient to achieve the 2% price stability objective. However, the Bank of Japan’s assets as a share of GDP rose strongly, from around 30% of GDP before QQE to over 90% of GDP currently (while the ECB’s assets accounted for over 30% of GDP); and, nominal 10-year yield dropped from slightly below 1% before QQE to around -0.3% in July 2016 and to around 0% currently. Thus, it is difficult to claim that the monetary policy accommodation has been insufficient. In my view, the issues could be related to the ‘limited’ effectiveness of monetary policy rather than the ‘insufficient’ scale of monetary accommodation. This may be attributable to a decline in real wages since 2013, the public’s concerns about the sustainability of the social security system and public debt, and/or uncertainty about life expectancy. Note: Inflation refers to CPI inflation excluding direct effects of the consumption tax hike. Source: Cabinet Office, Ministry of Internal Affairs and Communications, Bank of Japan. Will the natural interest rate rise? The final issue is whether the natural rate of interest will start to pick up in the future. In the speech mentioned above, Kuroda explained that QQE was aimed at raising the natural rate of interest. However, the natural rate of interest may decline (or at least, it may not rise) in the foreseeable future for two reasons. One is that Japan’s savings are expected to grow for a while (a flow effect) due to firms’ high profits and increased employment. Moreover, downward pressures will continue to be generated on the natural rate of interest as the large growing outstanding amount of deposits and cash will remain unutilised for the time being (a stock effect). Indeed, Japan’s current account surplus as a share of GDP has improved recently from around 1% in 2013–2014 to nearly 4% in 2016, because the saving–GDP ratio increased while the investment–GDP ratio remained nearly constant. The outstanding amount of deposits and cash held by firms and households has also grown faster than the outstanding amount of loans extended to them. The second reason is that the potential economic growth rate is expected to remain sluggish or to decline, so the natural rate of interest will remain low or be lower. Japan’s potential economic growth may decline from the current 0.7% if labour’s contribution turns negative and TFP contribution continues to decline. There are a few implications for monetary policy. First, the Bank of Japan may end up maintaining very low nominal interest rates and yields for a long time to make sure that the real interest rates will be sufficiently low—even if the monetary easing policy has not been very effective in raising aggregate demand and inflation. This might happen at the expense of greater adverse side effects (such as negative impacts on the profitability of the financial sector, distortions in financial and capital market pricing, growing inequality, etc.). Second, the likelihood of short-term interest rates facing the zero lower bound (or the effective lower bound on short-term interest rates) in the recessionary phase will be high, so the Bank of Japan must be prepared for another unconventional monetary easing policy. In anticipation, the Bank must first unwind its current unconventional monetary policy; otherwise, its balance sheet will continue to expand almost indefinitely. The measures to cope with this should be discussed with the government in advance as well. Third, the underperformance of inflation relative to the inflation target is likely to be more persistent. One option is to inform the public and markets that the Bank of Japan will attempt to achieve the 1% inflation stably for the time being while maintaining the 2% target in the long run. Alternatively, adopting a range of ±1% around the 2% target is another option. This may be preferred to the former since it is more acceptable to the public as Japanese people dislike inflation – the Bank of Japan does not need to change the official 2% price stability target; and, the Bank might be able to change its current policy into a more sustainable one (i.e. raising the 10-year target and tapering the asset purchases toward zero). Finally, the natural rate of interest may rise in the longer run (about seven years ahead and thereafter) when many elderly workers (baby-boomer generation) leave the labour market completely as they will be over 75 years of age. This will deepen the labour shortage and amplify the growth constraint, suggesting a decline in the natural rate of interest. On the other hand, the number of retired households is expected to rise and begin to consume rather save, thereby contributing to a lower saving rate and an increase in the natural rate of interest. If the latter effects become stronger than the former, it is possible that the natural rate of interest may begin to rise. Bank of Japan (2016) Comprehensive assessment: Developments in economic activity and prices as well as policy effects since the introduction of the Quantitative Qualitative Monetary Easing (QQE), The Background. Bernanke, B (2017), “Some reflection on Japanese monetary policy”, Presentation at the Bank of Japan, 24 May. Draghi, M (2017), “Sustaining openness in a dynamic global economy”, Speech at the Economic Policy Symposium of the Reserve Bank of Kansas City, Jackson Hall, 25 August. Fujisawa, S, Y Iwasaki, I Muto, K Nishizaki, and N Sudo (2016), “Developments in the natural rate of interest in Japan”, Bank of Japan Review 2016-E-12. Holston, K, T Laubach, and J C Williams (2016), “Measuring the natural rate of interest: International trends and determinants”, Federal Reserve Board, Finance and Economics Discussion Series 2016-073. Imakubo, K, H Kojima, and J Nakajima (2015), “The natural yield curve: Its concept and developments in Japan”, Bank of Japan, Research and Studies Research LAB no15-E-3, 1 May. Kuroda, H (2017), “The role of expectations in monetary policy: Evolution of theories and the Bank of Japan’s experience”, Speech at the University of Oxford, 8 June. Laubach, T and J C Williams (2003), “Measuring the natural rate of interest”, Review of Economics and Statistics, 85(4): 1063–1070. Laubach, T and J C Williams (2016), “Measuring the natural rate of interest redux”, Business Economics 51: 257–267. Miura, H and M Azuma (2017), “Tomobataraki Setai no Zouka no Haikei to sono Shohi Shitsutsu he no Eikyo”, Bank of Japan Review 2017-J-14. OECD (2017) OECD Economic Outlook 2017. See the update on the estimates of the natural rates of interest based on Laubach and Williams (2015), available on the website of the Reserve Bank of San Francisco.